Welcome Pink Saturday readers! I hope you like my array of "eye popping pink" for you. I of course, bought these items for the site because my eye just goes right to this color. 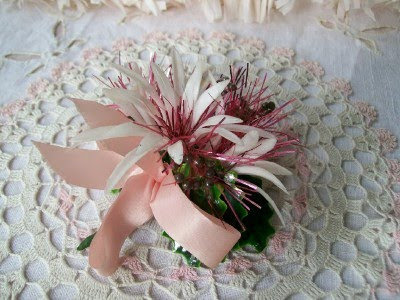 I just started finding these Christmas corsages. Better in pink, yes? 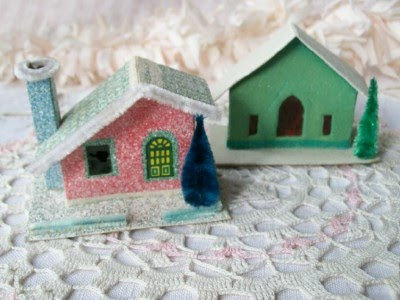 The glitter houses are back! Just in time to start buying for Christmas. 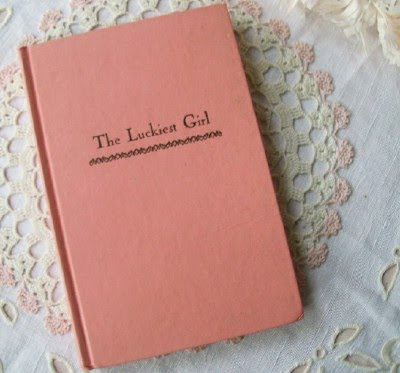 And of course, there's a PINK one! 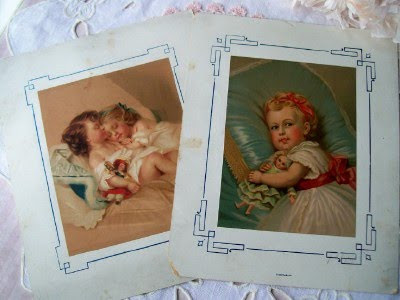 The sweetest soft pastel tones (pink rosy cheeks) in these victorian child prints. The one on the right has a signature in pencil with a date pf 1876. This is my favorite piece this week. So hard to find these aurora borealis style crystal necklaces (and three strands, too!) but I did... it is lovely. For more pink fun...check out Beverly's blog at How Sweet the Sound. Stop by and visit a blog you've never seen before... I'm off to go visit Beverly's long list of pinky fans! Beautiful pinks today, love that necklace it is gorgeous. Hope you have a wonderful Pink Saturday. I really like all your pink finds. You have such a nice variety of things you will enjoy. Happy Pink Saturday. I love the necklace. Very vintage chic. I love the beautiful pinks you've chosen to share with us today. I hope you are having a great day. I love the pinks you have shared today. The necklace is gorgeous! All so pretty, but I love the book best! Happy Pink Saturday! Pink is my third favorite Color...but don't tell anyone! Super great Pinks!! I just love them all! I have my internet back! I'm trying to catch up! 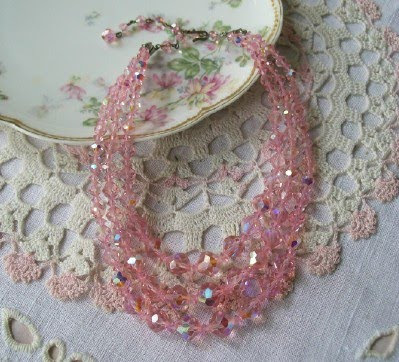 Such wonderful pinks..the necklace is gorgeous...but I love them all. Happy Pinks and have a most wonderful week. I love very much your pink necklaces. Love that pink crystal necklace. Hello Jillian. Those are lovely. I was just doing a search on the Luckiest Girl and found the image on Bing. I've had this book since about 1962. Read and reread it over and over while growing up. I also had Run Sheep Run and haven't spotted that on the net yet.